Poet and essayist Johannes Anyuru. 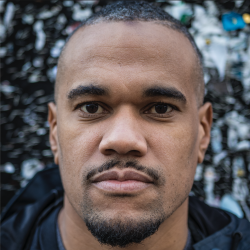 Johannes Anyuru's essay "Ahambra," written with Sara Nelson and translated from the Swedish by Kira Josefsson, recently appeared in the magazine Words Without Borders. In it, Anyuru tells the story of his deepening Muslim faith and its effects on his sense of belonging in Sweden. Born to Ugandan and Swedish parents, Anyuru began exploring Islam seriously during his early twenties, after experiencing a series of "[b]rief eruptions of meaning," including a bout of envy on a subway. I was particularly drawn to certain archaic images that I associated with events from my own life—a heavy rainfall devastating a garden, a star rising, hoofs stirring up dust against the sky. And that cosmology, which described our universe as a ring lost in the desert, and that desert as another ring lost in a larger desert, and on and on, to me became an illustration of quantum physics and string theory’s conception of the universe. . . . But others do not share this understanding of Islam. After a terrorist attack perpetrated by a Muslim, Anyuru notices "the line that separates those who in that moment had their humanity questioned . . . from everyone else." He feels alienated from others in his country who can mourn the loss of lives without feeling as though they are personally under suspicion. I am not a failure of evolution . . . I am a citizen . . . There is no need for anybody to take my veil off. I am part of the cosmos. I am a resource . . . I am not lost. That word, love, which recurs, might be all I can write about it without betraying myself. And when I write the word “love” I mean the love that knocks us to the ground and makes the body shake, only to lift us, helpless, up into the night, at once joyful and unhappy since through it, we see that we’ve found a path to our destiny. It seeks us when we seek it. Much of the essay reflects upon the author's trip to Alhambra, an ancient castle and fortress, located in what is now Granada. Alhambra is a UN World Heritage Site, and students might be interested in seeing a gallery of images. Or, you might place students into small groups, with each group taking a different "virtual tour" through the collections on Alhambra's website. Once they have read the essay, you might have students discuss or write about their own values and beliefs: how they developed over time, questions they still have, etc. Or, you might focus in on a rhetorical device that recurs throughout the essay: the opposition of "I am not/ I am"
I am not a cloud of floating whispers. I am a core of silence surrounded by a deafening roar. Have students write poems or essays exploring oppositions in their own lives. "I am not . . . / I am . . ."
Finally, it might be interesting for students to write a partnered essay, an essay that is the "long, winding conversation" in which Anyuru and Nelson are engaged here. Note that their stories and reflections sometimes intersect, but do not directly respond to each other. PAIRS WELL WITH . . .